When I began making kanteles in 1995, there was only one booklet available in English that gave instructions for playing small kanteles - written by Heikki Laitenen and Hannu Saha, and translated by Carl Rahkonen - and that one was limited to 5 string instruments. I asked a number of kantele players and instructors in the USA if they had any plans to write a book for beginning players - none had any plans. It became obvious to me that if people were going to buy kanteles from The Kantele Shop, they would need instructions in English. I realized that it was going to be up to me to write instructions - at least enough for people to begin playing. The result was a booklet that has gone through numerous editions - called A Guide For Playing Small Kanteles. But my hope was that someone eventually would write a guide that was more complete, and more detailed. That finally has happened! 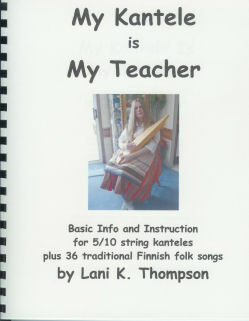 Lani Thompson has published (as of March 2004) her book called My Kantele Is My Teacher, Basic Info and Instruction for 5/10 string kanteles. It includes 36 traditional Finnish folk songs. I highly recommend this book for beginning players, as well as those more advanced. You can get it through her website. Because Lani has written this excellent book, I have decided to no longer print out copies of my Guide and will not be providing them with kanteles that I sell. An early version of it still is available for download as a pdf file - the link to download it can be found on the Kantele Shop Main Page.